Le Transi de René de Chalon , Church of St. Étienne, Bar-le-Duc, France. Richier primarily worked in the churches of his native Saint-Mihiel and from 1530 he enjoyed the protection of Duke Antoine of Lorraine, for whom he did important work. Whilst Richier did sometimes work in wood, he preferred the pale, soft limestone with its fine grain, and few veins, extracted at Saint Mihiel and Sorcy and when working in this medium he experimented with refined polishing techniques, with which he was able to give the stone a marble-like appearance. One of his finest works is the "Groupe de la Passion", consisting of 13 life-size figures made in the local stone of the Meuse region. It can be found in the Church of St. Étienne. It is also known as the "Pâmoison de la Vierge" (Swoon of the Virgin, the Virgin fainting, supported by St John). Other works attributed to him are in the Church of St. Pierre, Bar-le-Duc, and in the Louvre. Perhaps more than any other French artist of his period, Ligier Richier produced some notable works linked to the "Passion"; a mixture of calvaries, pietàs and "mise au tombeau" (a depiction of the entombment). Some researchers believe he was born in Dragonville near Commercy, but there is evidence that he was born in Saint-Mihiel   The people of Saint-Mihiel and its immediate neighbourhood are known as "Sammiellois". It is not clear when Richier was born. Commercy is a commune in the Meuse department in Grand Est in north-eastern France. The 18th-century Lorraine historian Nicolas Luton Durival (1713–1795) was born in Commercy. Briey is a former commune in the Meurthe-et-Moselle department in northeastern France. On 1 January 2017, it was merged into the new commune Val de Briey. 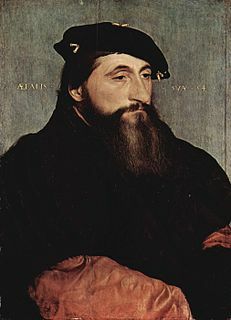 Nicolas of Lorraine, Duke of Mercœur was the second son of Antoine, Duke of Lorraine and Renée de Bourbon. Louis de Lorraine was a nobleman of Lorraine who attempted to claim the Kingdom of Naples. He was styled as the Count of Vaudémont. ↑ Henri Lepage published a paper in 1854 and quoted a letter discovered in the Meurthe-et-Moselle archives written by Antoine, the Duke of Lorraine and dated 18 August 1530, which indicated Richier's birthplace as Saint-Mihiel.